This 28.5-inch aluminum model of the statue of William Penn (1644-1718) shares its intricate detail with the full-scale piece atop Philadelphia City Hall, down to the lace cuffs and decorated buttons. Penn’s right hand, whose full-size fingernails are three inches long, points gracefully out at the city in a gesture of blessing. His left hand holds the Charter of Pennsylvania, which features readable text. His arm rests on a tree stump meant to symbolize the first of many trees cut in his “green country town.” This model is a scaled-down version of the larger one designed by Alexander Milne Calder (1846-1923). One curious aspect of this model is that it is made of aluminum, which was only commercially available after 1884. As such, the metal was still a relatively expensive medium to cast in by the time the model was made—making it likely that the model was made for a specific reason or patron. This particular model was given to the Historical Society of Pennsylvania in May 1930 by Mrs. Henry C. Forrest, whose husband directed the casting and erection of many of City Hall’s sculptures, including the full-sized William Penn Statue. Designed by Calder, the statue of William Penn and the dome it sits upon began as a public works project in 1889. Calder’s attention to detail is evident in this statue, which is perhaps his most well-known work. He consulted with the Historical Society of Pennsylvania about what attire would be most appropriate for the era, eventually settling on buckled shoes, stockings, knee britches, a long buttoned jacket, a cravat, and a broad-brimmed hat. In designing and constructing his statue, Calder was assisted by his son, Alexander Stirling Calder (1870-1945). Tacony Iron and Metal Works secured the contract to cast the large bronze work in 1889, and the fourteen-piece final product was lifted to the top of the City Hall dome in November 1894. At twenty-seven tons in weight and thirty-seven feet tall, the full-sized statue of William Penn atop City Hall looms large over Philadelphia, much like the man it depicts once did. Much ado was made about the final orientation of the statue. To the chagrin of its designer, the statue was installed facing northeast, toward the site where Penn reputedly signed a treaty with the Lenni-Lenape. Calder asserted that the statue was supposed to face south, as its northeastern orientation means that Penn’s face is perpetually cast in shadow and thus obscures the sculpture’s detail. Over the next two decades, Calder designed more than 250 other sculptures for the building, many of which portray abstract ideas like virtues, seasons, and cardinal directions. Other sculptures on the exterior of City Hall speak to an international theme, depicting immigrant and native peoples who helped found the Americas. Still others represent animals and mythological figures. Throughout, these sculptures “express American ideals and develop American genius.” Three generations of Calder sculptors left their mark on Philadelphia. Calder’s son and grandson, Alexander “Sandy” Calder (1898-1976), went on to become famous sculptors in their own right, providing fountains, sculptures, and mobiles in various areas of the city, including Logan Square and near Memorial Hall. The evolution of Philadelphia sculpture can be traced through the Calder family. 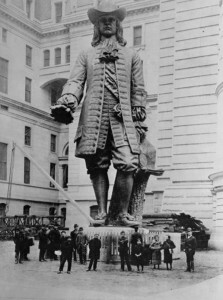 Of the five statues of William Penn in the city, the one at City Hall is the largest and most renowned. For ninety-three years, the city stuck to its “gentlemen’s agreement” to disallow buildings higher than the brim of Penn’s hat—a whole 538 feet above street level. This agreement dictated a major attribute of the city’s architecture for almost a century. Many buildings approached the hat’s brim, but none broke the level until the construction of One Liberty Place in 1987. Fears of what this construction meant for the city gave rise to the so-called “Curse of Billy Penn.” For twenty years, none of Philadelphia’s major professional sports teams was able to secure a championship win. In 1997, the statue was even dressed in a tailor-made Flyers jersey in the hope that it might help them to the Stanley Cup Finals. The Phillies broke the supposed curse in 2008 when they won the World Series. Superstitions aside, the statue continues to give rise to many conversations about Philadelphia’s founder and his hopes for the City of Brotherly Love. William Penn was a Quaker and strong advocate of democracy and religious freedom. In remuneration of a debt, Charles II granted Penn the substantial tract of land that became Pennsylvania. Within this colony, Penn planned to build Philadelphia, the “green country town” of large lots and open squares..
Seeking more than just a beautiful landscape, Penn envisioned a “Holy Experiment” of religious tolerance in his new colony. 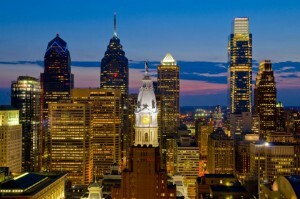 Historian Emma Lapsansky-Werner of Haverford College has asserted that Penn “raised” Philadelphia almost like he would a child, hoping to teach and guide the city and its residents along a path of tolerance and faith without coercion. This idea of the colony as a family was further enforced by the city’s very name, Philadelphia—a city based on brotherly love could surely look past religious tensions to a shared belief in democracy and tolerance. Text by Kelsey Ransick, a museum professional in the Philadelphia area with an MA in History from the University of Delaware.